A Harvard-educated lawyer in Los Angeles has loaned his home to a homeless family a full year because, for him, it’s the right thing to do, CBS News reports. Tony Tolbert, 51, will move in with his mother while the new family takes the year to get back on their feet. 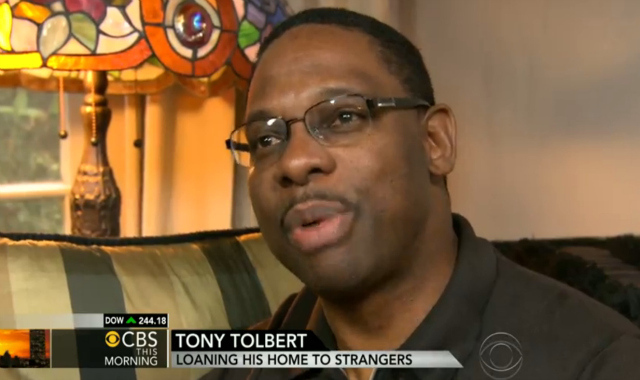 Tony told CBS News that his giving spirit comes from his dad who always opened the family home to those who needed a place to stay. In fact, Tony says he could not remember a time there wasn’t someone extra living with the family. Dukes was sharing a single occupancy room at the shelter with three of her children, but it was for kids only. Another problem was that her older son could not join them, so Dukes was truly in a bind before taking Tony’s offer. “My heart just fills up and stuff, um….I’m just really happy,” Dukes said tearfully. Tony also gets emotion when talking about how generous his father was and how important he feels it is to carry on his legacy.